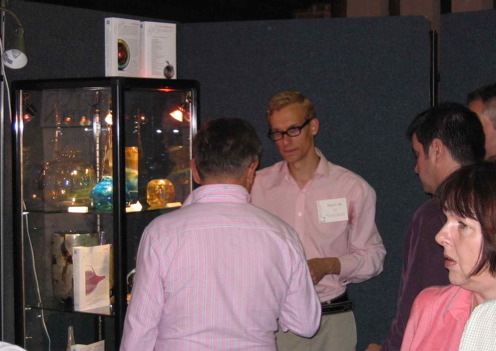 …at the Cambridge Glass Fair, September 24th 2006. 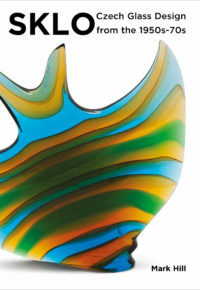 300 Years Of Collectable Glass In One Day – one of the two packed exhibition halls. 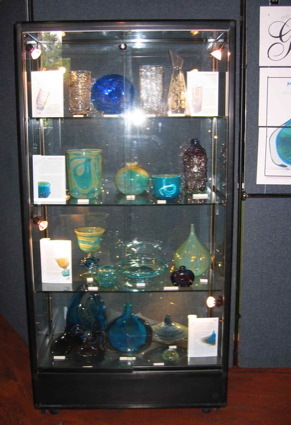 As well as plenty of Mdina Glass and Isle of Wight Glass, there truly was something for everyone, as ever. 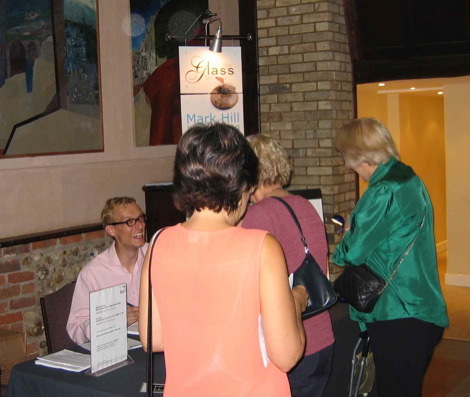 Setting up the foyer exhibition, which was devoted to Mdina Glass and Isle of Wight Studio Glass in honour of the book launch. Not only were most of the pieces on display exceptionally rare or the finest examples known, but it was also the first time that Michael Harris’ work had been displayed in such a manner, enabling everyone to see the diversity, inherent skill and beauty of his designs together. The first cabinet contained examples from the early years of Michael Harris’ life. 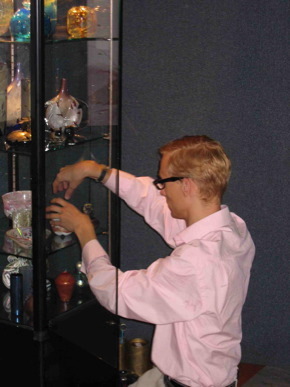 The top shelf shows cut and diamond point engraved pieces designed and made by Michael when studying at Stourbridge and the Royal College of Art, London, as well as a Chance Glass ‘Calypto’ decanter. 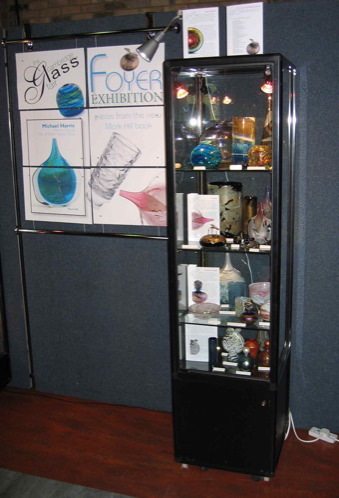 The three shelves below displayed rare and characteristic designs, including the classic ‘Fish’, designed and produced by Michael at Mdina Glass on Malta from 1968-72. The second cabinet contained examples of pieces designed by Michael Harris at his second studio on the Isle of Wight from 1972 until his death in 1994. 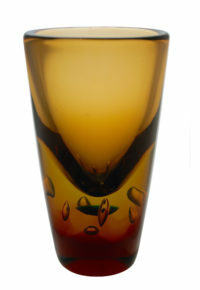 These included the ‘swirling’ ranges of the 1970s, including, Aurene, Seaward and Tortoiseshell, and the award-winning Azurene range that built on Michael’s growing global reputation as a glassmaker and designer. The two lower shelves displayed later ranges designed by Michael in conjunction with his two sons, Timothy & Jonathan, and his wife Elizabeth. Attendance at the fair was extremely strong, with a great many collectors being keen to acquire the book after having waited over four years for it to be completed. 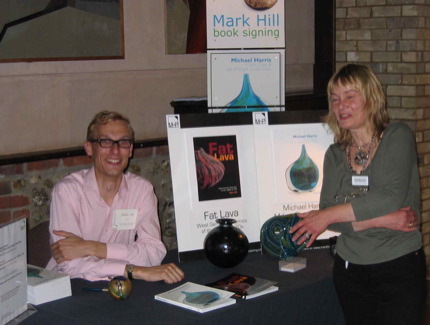 In addition to Elizabeth and Timothy Harris from Isle of Wight Studio Glass and Ron and Ann Wheeler from Artius Glass, the author Mark Hill was available to answer the numerous questions that the book and exhibition generated. 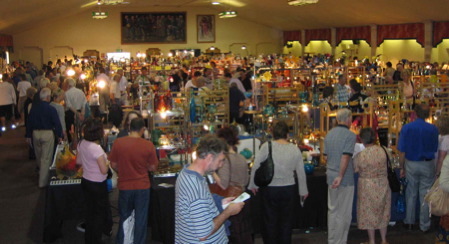 One of the many reasons why these events are enjoyable is that one gets the chance to meet up with friends and fellow collectors to swap information – and, quite frequently, pieces. Many thanks to Paul and Christina Bishop and Denis Hebden of Oxbridge Fairs and CircaGlass for the opportunity to launch the book at such a well attended event, as well as for their continued support, promotion and superb design skills as regards the exhibition and website. Thanks must also go to Gary Hendy and Elizabeth and Timothy Harris for their much appreciated support of the exhibition.